You are here: Home 2013 October Cisco Nexus 3100, Ready to Support VMware NSX? Cisco’s latest switch (the 3000 series of the Nexus switches was upgraded recently by Cisco, called Nexus 3100 series) has added an interesting twist to the company’s battle royal with VMware over next-generation virtual networking and data center operations management. Cisco Nexus 3100 top-of-rack data center switch (Cisco announced it last month), a follow-up to the 3000 series of the Nexus switches. Cisco emphasized the 3100’s low-latency and high-frequency processing power, and also confirmed that the switch supports OpenFlow and overlay software-defined networking (SDN) models, such as VMware’s NSX. Why Does Nexus 3100 Support VMware NSX? VMware’s NSX network virtualization strategy is an overlay approach, meaning that its software that runs on top of existing network hardware. Since VMware unveiled NSX at VMworld in August, some have questioned how the integration between NSX software and network hardware would actually work. NSX makes those connections in a variety of ways, including via software gateways and a protocol named OVSDB, which provides a link between the software and hardware switches. That’s usually enough capacity for NSX deployments, especially early test cases. But for larger rollouts, NSX can benefit from having a top-of-rack switch to unite the software and hardware. From the start, VMware has had solid support for NSX from top-of-rack switch makers such as Arista, Brocade, Dell, HP and Juniper. Cisco, however, was missing from the line-up–a point VMware officials dismissed as no big deal in that not all NSX deployments require top-of-rack switches anyway. Fast forward a couple of weeks and now Cisco has the Nexus 3100, which a company official confirmed supports OpenFlow and the “full programmability” for SDN overlay models such as NSX (Cisco’s marketing materials do not specifically mention the VMware technology). This is interesting because Cisco has pointed out the limitations of a software-only approach, noting the benefits of an Application Centric Infrastructure (ACI) model, which just so happens to be what Cisco spin-in Insieme Networks is doing. So does the Cisco Nexus 3100 represent a change in Cisco strategy? Not quite, IDC analyst Brad Casemore says. Cisco’s primary motive in releasing the Nexus 3100 is likely aimed at dulling attention that competing network hardware vendor Arista has recently been receiving in high-throughput switches. “I don’t think Cisco’s intent is to help the folks at VMware with this switch,” Casemore says. The bigger point is that while Cisco’s new switch technically works in a VMware virtual networking environment, the competition between these companies is just getting started. “We are at a point where sides are being chosen in SDN and network virtualization,” says Eric Hanselman of the 451 Research Group. Vendors like Citrix are lining up behind Cisco while HP, Dell and Brocade behind VMware and NSX in terms of supporting top of rack switches. Cisco may be supporting some NSX use cases with the Nexus 3100, but the company is still focused on its own approach. Cisco Nexus 3100 line of switches, a part of Cisco’s Unified Fabric Data Center portfolio, are highly scalable, power efficient and flexible. They feature significant improvements in port density, programmability and VXLAN capable gateway functionality that are ideal for data center top-of-rack (ToR) deployment scenarios. As the second generation Nexus 3000 series, Cisco Nexus 3100 offer a balanced mix of performance, cost, simplicity, and an innovative feature set that complements the rest of Cisco’s overall top-of-rack solutions. 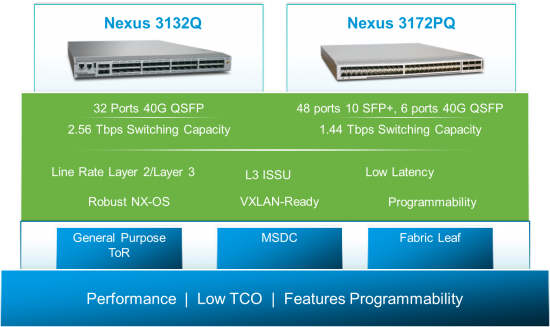 Nexus 3132Q, and Nexus 3172PQ (more details are shown the following figure), both switches are 1RU in height with 32 line rate 40-Gbps Quad Small Form-Factor Pluggable (QSFP+) ports for the Nexus 3132Q and 48 line rate 10 Gbps SFP+ with 6 fixed QSFP+ ports for the Nexus 3172PQ. All of the QSFP+ ports on the device can operate as a native 40-Gbps port or a four independent 10-Gbps ports. The switches also have a serial console port, USB port, PPS connector and an out-of-band 10/100/1000-Mbps Ethernet management ports. From a software perspective, the rich NX-OS operating system fully supports the Cisco Open Network Environment framework with Openflow and the onePK toolkit in addition to standards based Layer 2 and Layer 3 features. What does this mean for your data center? Some examples include: Improved workload flexibility, higher availability, and enhanced traffic monitoring. All of which help to lower TCO. Here we are looking forward to the additional details on the switches including whitepapers, videos, and use cases in the coming weeks.